While Android based smart-phones have the best web mapping service, Google Maps, which can help you find your way if you are lost, what would you do if you lost your phone on the other hand? Fortunately, out of the 600,000 or so apps in the Google Play Store, several can help you do just that. Some of these apps come with extensive features, allowing you to geo-locate your device using the built-in GPS receiver and internet connectivity. You can also wipe your device’s storage remotely to prevent your sensitive data from falling into wrong hands (assuming you have irretrievably lost your device) or use its front-facing camera to snap discreet photos of whoever is using your phone. However, in this guide, we will help you set up your Android device to make a sound on your command so you can easily locate it. Make sure you have internet connectivity and then run the Google Play Store app from your device. Using the app’s search function, look for ‘Wheres my droid’. This is one of the most popular apps in this category and we will be using it for this guide. Once you locate the app, install it on your device (it is a free app). Once the app is installed, you can run it from the notification panel (first time) or through the app drawer. The app’s welcome page will advise you to go through the quick intro guide - you can choose to skip it, but you should press the ‘next’ button to proceed. On the next page, titled ‘Attention Words’, the app will explain how you need to send a text to your device from another phone in order to initiate certain commands. This feature comes in handy when your device does not have internet connectivity. You can then communicate with the app using text messages. The ‘Attention Words’ page will have two boxes to fill, ‘Ring Att Word’ and ‘GPS Att Word’. By default, the text boxes will say ‘WMD Ring’ and ‘WMD GPS’. These are words you have to text your device in order to make it ring or switch on the GPS respectively. You can change them if you want, or use the default values. Skip through the next page (not applicable for this guide but a useful feature you should explore) and choose ‘Finish’. On the next page, you can read through the ‘Terms and Agreements’ and choose ‘Accept Terms’ to continue. Now you can close the app and type WMD Ring in another phone’s text message editor and send it to your own device. Your device should start ringing after receiving the text, even if it is in silent mode. 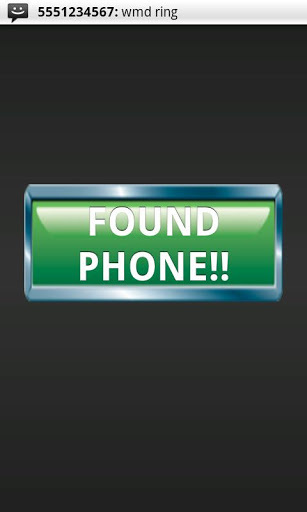 You can then press the ‘Found Phone’ button to stop the ringing.